The Lodge at Flying Horse is poised to become one of the most desirable resort and meeting destinations in Colorado featuring a Rocky Mountain Tuscan style and essence which blends seamlessly with the stunning Flying Horse Club facilities and all of its amenities. The Lodge will be an extension to the existing landscape of the community offering rich warm sophisticated and elegant color palettes to complement the posh yet comfortable furnishings and finishes. Accommodations include 40 Lodge rooms and four two-bedroom Villas featuring 55 inch LCD TVs/fireplaces/deluxe bathrooms/balconies or terraces and views of the golf course and/or Rocky Mountains. Complimentary Internet access is available throughout the hotel and the property also offers 4 restaurants and a juice bar/full service spa/18-hole championship golf course by Tom Weiskopf with a 43000 sq. 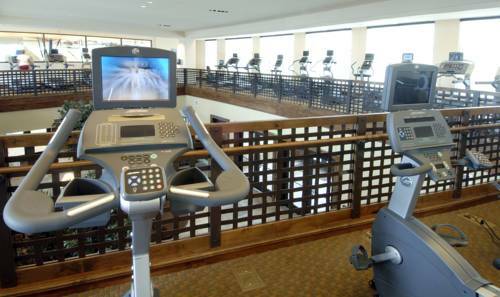 ft. club house/nine tennis courts/an expanded fitness center with 92 individual pieces of equipment and a pilates-yoga-aerobic studio. With 10000 sq ft of indoor and outdoor event function space the Lodge at Flying Horse is ideal for weddings/meetings and special events. The Rotunda: A private dining experience for up to 36 guests offering private terraces and a fire pit. The Grill: Located in the Athletic Club The Grill offers a relaxed atmosphere with a full service menu 7 days a week from 11AM until 1PM Memorial Day through Labor Day. The Juice Bar: Located at the Athletic Club The Juice Bar offers a quick and easy Grab and Go barista style cafe open 7 days a week until 11AM during the summer and from 7AM-7PM during the winter. Portofino: This smaller breakout room is ideal for executive meetings with use of the existing conference table and executive high leathered back chairs and LCD TV. This room is hard walled and secured. Milano: The Milano features a fireplace, terrace with floor-to-ceiling windows, panoramic views of the golf course and Front Range, Wi-Fi access, executive conference tables and ergonomic meeting chairs. Turin: The Turin features a fireplace, terrace with floor-to-ceiling windows, panoramic views of the golf course and Front Range, Wi-Fi access, executive conference tables and ergonomic meeting chairs. Verona: The Verona features Wi-Fi access, executive conference tables and ergonomic meeting chairs. Thomas Blake South: The smaller section of our ballroom offers floor-to-ceiling windows and doors and access to the terrace as well as views of the golf course Pikes Peak and the Rocky Mountains. Thomas Blake Terrace: Connected to both sections of the Thomas Blake Ballroom is an outdoor covered terrace with sweeping views of the Tom Weiskopf golf course Pikes Peak and the Front Range of the Rocky Mountains. Thomas Blake North: The largest section of our ballroom offers floor-to-ceiling windows and doors/access to the terrace/views of the golf course Pikes Peak and the Rocky Mountains and a built-in screen and LCD projector. Sienna: The larger of the three breakouts is ideal for executive meetings with use of the existing conference table and executive high leathered back chairs and LCD TV. This room is hard walled and secured. Venezia: A great room for small informal meetings or to be used as an office or storage space. This room is hard walled and has a built-in LCD TV. The Courtyard: This grand outdoor space is perfect for lunches dinners receptions or teambuilding events where guests can enjoy the fresh Rocky Mountain air and get their daily dose of Vitamin D sunshine. The 1500 acre community of Flying Horse along with The Club and Lodge rests in Northeast Colorado Springs and is adjacent to Black Forest - 20 minutes from Downtown Colorado Springs and a scenic 50-minute drive from its sister city Denver. Conveniently located 25 minutes from the Colorado Springs Airport and 60 minutes from Denver International Airport it offers an easy-come easy-go lifestyle for both the casual traveler and busy corporate executive.